Sea Scout Ship 5 Navesink is part of Sea Scouts of America, which is part of Boy Scouts of America. Sea Scout ships cater to co-ed youth age 14-21, with a special focus on maritime activities. Meetings are generally held on SUNDAYS from 4:30 PM - 5:30PM at Monmouth Boat Club in Red Bank. For more information about the program and current activities, contact Skipper Gayle Horvath at 732-530-2035 or gayleh8@gmail.com. During the summer months most meetings take place in a variety of boats on the water. Come find out what Sea Scouting and Sea Scout Ship 5 Navesink are all about. Sea Scouts are encouraged to bring friends who would like to know more about Sea Scouting. We also welcome all youth age 14-21 and parents who want to know more about Sea Scouting and SSS Navesink. Why Sea Scouting and NMHA? The award-winning and very successful River Rangers summer program provides on-the-water experience for kids age 10-14, and NMHA was looking for a program that River Rangers could transition to at age 14+. In 2011 a decision was made to sponsor and manage a Sea Scout Ship which is a unit within the Venture Scouts of the Boy Scouts of America. Sea Scout ships are open to co-ed youth age 14-21 so provided a perfect next opportunity for River rangers as well as attract all youth interested in the water and maritime activities of all sorts. And so Sea Scout Ship 5 Navesink was launched in 2011. A Sea Scout group is called a SHIP and its members are the CREW, and the youth officers (elected by the crew) have naval ranks: Boatswain, Boatswain's Mate, Yeoman, etc. The Ship's activities include Advancement where different nautical skills are learned and awards earned: from Apprentice, Ordinary, Able, to Quartermaster. Quartermaster is the highest award in Sea Scouting is as important (and as difficult) as the Eagle Scout Award. The big difference is at that the Quartermaster Award is open to both male and female crew. What does the crew of SSS Navesink do? The Navesink and Shrewsbury Rivers, the Raritan Bay, Swimming River, and the Greater New York Harbor provide an unmatched environment for waterborne adventures and education. The conditions encountered on these bodies of water provide a natural progression as a training ground and NMHA has identified many resources that can support Sea Scout programs. 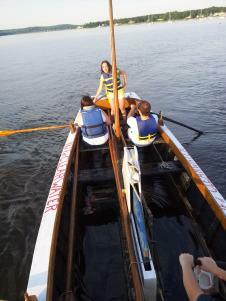 Therefore NMHA sponsored Sea Scout Ship “Navesink” with a group of enthusiastic high schoolers from the area. The Sea Scout program is based on rank advancement and culminates in the Quartermaster rank, which is actually more challenging to achieve than the famous Boy Scout Eagle rank. During the process of advancing through the sea scout ranks, the ship's crew learn about boat handling and boat safety, local and regional maritime activities and history, and learn how to work in teams as well as becoming more self-confident and self-reliant. SSS Navesink had its first weekly meeting on October 5th, 2011 and has met almost every week since. Officers have been elected, bylaws agreed, and activities have been planned and enjoyed. A work uniform has been agreed upon and is in the process of being put togehter, comprising navy work shirt with appropriate patches, and worn with jeans and sneakers and a cap with the Ship's logo. Since the inaugural meeting, the crew of SSS Navesink have organized and enjoyed three trips in 2012, and planning is under way for more in 2013. Sea Scout Ship 5 Navesink activities cost money and the crew and adult helpers of SSS Navesink fund-raise, but YOUR SUPPORT NOW is most welcome. Please Click the Donate button below to make a donation to SSS Navesink. You can use ANY CREDIT CARD. YOUR SUPPORT of these activities is very welcome! Thank you! Email us at navesinkmaritime@gmail.com if you have any questions about donating to SSS Navesink. A program that concentrates on maximum outdoor and on-the-water time. A focus on many types of boats, rather than dealing with the burden of owning and maintaining one or several larger vessels. A focus on environmental stewardship, outdoor skills, boating skills and team building. A program that allows scouts to progress from simple small craft to larger more complex craft. Large boat experiences on truly exciting vessels such as large traditional schooners, research vessels and racing yachts. The program will have all the traditional support of BSA and GSA plus the technical and local program support of NMHA. Anybody 14 and older can join in any time!